After seven seasons, Seattle Dance Project and its company of experienced performers has reached its swan song. Project 7 featured three works by distinct Seattleites Amy O’Neal, Wade Madsen, and Iyun Ashani Harrison, along with a short video tribute to the life of Kory Perigo, a founding member of SDP who died last September. Throughout the performance, the professionalism and skill of the performers did justice to the physical and mental demands of each piece. 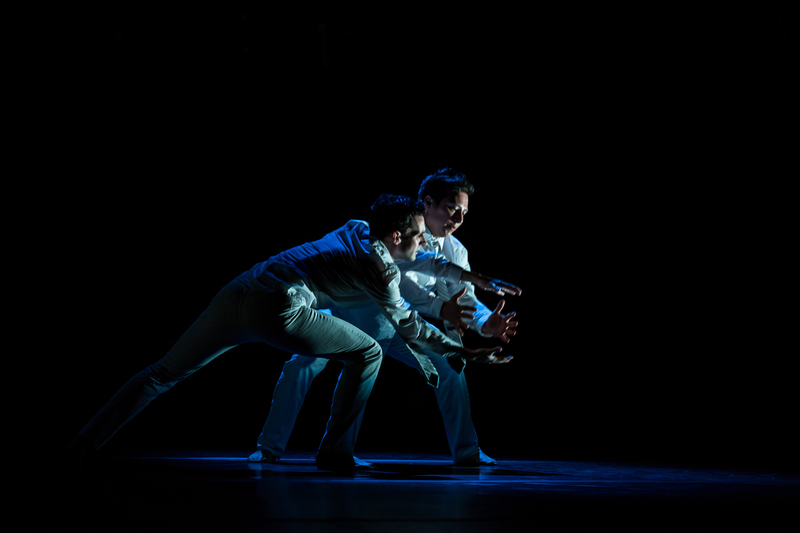 After the production on May 2, 2014, the company hosted a Q and A session, which allowed the choreographers to discuss their process and intentions for the piece. Timothy Lynch and Chris Montoya performed O’Neal’s Dessa Suites to open the show. Inspired and set to the music of Minneapolis musician Dessa, the piece began the night on an impressive, but subdued note. Within their clean technique, Montoya’s smooth control and Lynch’s relaxed, carefree manner gave the aggressive choreography a gentle quality. 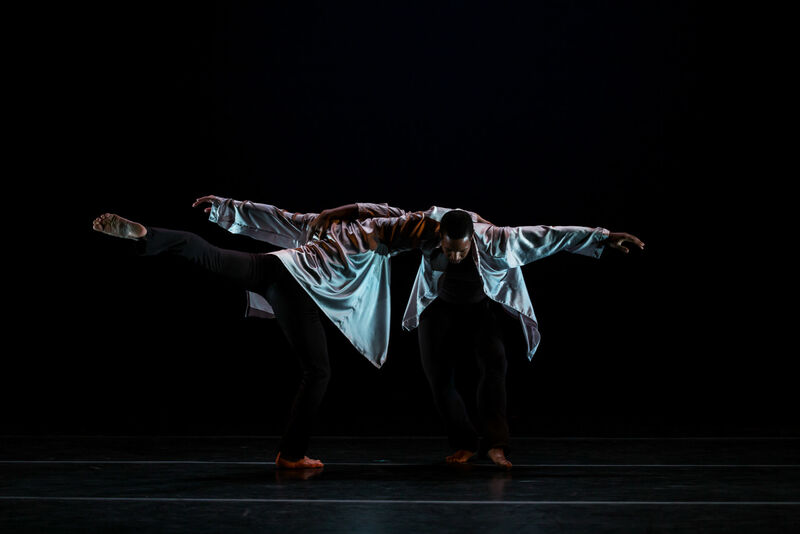 In her description of Dessa, O’Neal mentioned boyhood and a brotherly relationship as predominant themes in the piece, but these ideas took a backseat to the performance quality of the dancers. Their long arabesques, expressive gestures, and tight unison provided a complement to the music that was satisfying to watch with or without a higher purpose. Though it enhanced much of the work, the lighting by Meg Fox fell short of its potential, occasionally obscuring important moments and distracting from the subtle emotions of the dancers. After the first intermission, the video tribute led into Harrison’s The Leaves Have Fallen. Harrison recently performed Leaves with Sam Picart at BOOST. This time, Ezra Dickinson joined Harrison on stage, imbuing the piece with something like wisdom. Dickinson brought a mature, almost shrewd presence to the stage, less eager and more matter-of-fact than Picart. In this performance, lifts and transitions were seamless, a constant connection between the dancers carrying them from one set to the next. In the second viewing, the structure of the piece rose to the surface, highlighting the identities of the characters and reflecting the development of their dialogue. The work’s vocabulary and the magnetic ebb and flow of the dancers’ spatial relationship implied an intimate relationship, which can easily be construed as a depiction of romantic struggle and loss. Harrison stressed in the talk that his mentorship of a younger dancer and the experience of sending him off to a new opportunity inspired the piece. At its heart, Leaves is a tough conversation between two people who love and respect each other, who rely on each other, yet have separate paths to follow. The final piece of the evening spiced things up considerably from the cool energy of the previous works. In WANT, Madsen’s choreography fluctuated between showcasing the dancers’ strong technical backgrounds and their Seattle weirdness. Alexandra Dickson and Joshua Grant started things off with a clever gender reversal. One at a time, they took the stage in old-fashioned undergarments and donned an appropriate pair of shoes before moving through an identical series of provocative poses. The fact that these appeared as natural on Grant as they did on Dickson exemplified the smart twists on the expected that peppered the work. Reminiscent of a 1940s era musical, WANT made great use of a chorus that complemented and enhanced the solo work. At one point, the cast formed a loud stomp crew, moving around the edges of the stage—as they crossed in front of Dickson, their act of obscuring her made her solo all the more interesting. “I want you to want” was the theme of the piece, reminding the audience that it’s healthy to be satisfied by the act of wanting. A theme of wisdom and age ran throughout Project 7. Many dancers express a depth of understanding and sense of grounding that comes with age, a change that can be both challenging and empowering. This energy could be felt tangibly in the movement of the dancers. In this vein, an interlude in WANT performed by dancers over 50 proved to be one of the most relatable and thought-provoking statements of the evening. This glimpse into the experience of aging as a dancer allowed us to see the inspiring promise in our own futures. Project 7 ran May 2-4, bringing an era to a close, and marking new beginnings for many of the company members. Most notably, SDP’s Artistic Director Timothy Lynch will be heading to Columbus, Ohio to take over the Dance Academy at Ballet Met, leaving behind a legacy of great influence in Seattle’s dance community. For more about the company and the dancers involved, visit their website.